Some Phillies rumours are swirling regarding Giants AA Catcher Tommy Joseph. Here are some pix of Joseph from the Eastern League All-Star Game earliar this month. Seen here Joseph was good about signing autographs and chatting with fans pre-game. He was the 2nd round pick for the Giants in 2009. I have noticed various other folks going and hope to find other bloggers at this year show. I plan on being at the show on Thursday. If anyone else plans on being there on Thurs let me know. Lots of folks have been posting about the NSCC here is just a sample. This is just one of a couple new directions we plan on taking Phiungo in the future. My wife and I have become foodies over the last several years. I am going to try and document some of our adventures in the culinary world. This first food related posting is related to a recent trip we took with 2 other couples to a restaurant on Philadelphia 13th street mini-dining row. Jamonera has a fun atmosphere and terrific food. I believe Jamonera is the Spanish word for Ham and this is very appropriate as any dish containing ham or bacon was solid. Sorry, I don't remember all the dishes that we had and the on-line menu does not appear to be up to date, but I wanted to publish some pix anyway with descriptions to the best of my ability. Jamonera's version of the ubiquitous Beet salad. That is deep fried goat cheese as the base. Among the best Beet Salads I have had at various places in the last year. I believe this is the Calamari - This is the one dish that was I felt was a little too decadent. The calamari was fried with chorizo, which seem to strong for the rest of the dish. Other notable dishes that I did not photograph were the decadent Spanish Breakfast, and the Stuffed Medjool Dates which were excellent. I was just a tad disappointed with the Albondigas - which are offered at the Jamonera sister outpost Barbuzzo. My memory of that dish was likely so good, that I was setting myself up for a bit of a disappointment. We had a party of six and Jamonera handled our table excellently. Service was courteous, prompt and very helfpul. Tapas meals are sometimes tricky, but there were no pacing issues at Jamonera. As noted above the food was very good with several dishes being quite noteworthy - Every dish was plated beautifully, the pix posted here really don't quite capture the various tapas as nicely as I would have liked. One of the missions of Jamonera is to introduce Sherry to their patrons. Our server did well guiding me through the Sherry menu. Ultimately I don't think Sherry is for me, but it was fun to try and get some background on the drink. Including Drinks Tax and Tips are meal came out to just under $110 per couple - which may sound like a lot for Tapas. For the quality and execution of the meal I actually found the pricing quite reasonable I should note that we did not have desserts. On Wednesday we got news on two recent World Series MVPs. The news for the 2008 winner Cole Hamels was extremely good, for 2009 winner Hideki Matsui, not so much. A favorite card in the Phungo Collection. One of the least favoite cards in the Phungo Collection. A few weeks ago Topps Released the 7th edition of the Allen & Ginter product. This coupled with the upcoming retirement of Chipper Jones and the recent move of Ichiro Suzuki got me thinking about the players that have been featured in Allen & Ginter. The set is good size but at 350 cards it is not nearly as big as Flagship or Heritage. Therefore most stars get included, but not all of them. 350 cards would average out to less than 12 players per team. In addition slots are lost to non-baseball celebs, subjects, and retired players so the number of cards per team averages closer to 10. Ichiro and Chipper are among the players that have appeared in all seven Allen & Ginter releases. And up unitl this point they have always appeared for the same team. If Ichiro sticks around to play in 2013, he very possibly could appear in that set as a Yankee or with another organization. I did a little resarch and found that there were 48 players that appared in every set from 2006-2012. Of those 26 made all 7 appearances representing a single team. The Cover Card for this post features Chase Utley who is among those 26 players to make 7 A&G appearances all for one club. A couple of catchers. Both of which should stick in A&G for a while. AL Central featured here. Konerko had a couple of seasons outside Chicago, but they were all pre-A&G. A-Rod and Josh Beckett both fell into the same category - multiple clubs, but were with teams other than their current one prior to the initial A&G release. Several players missed the 7 by one year. For whatever Reason Derek Jeter and David Ortiz were not included in 2010 A&G. I don't recall all of the 6 timers, but Jim Thome was one of them. I think Huston Street was also in there. 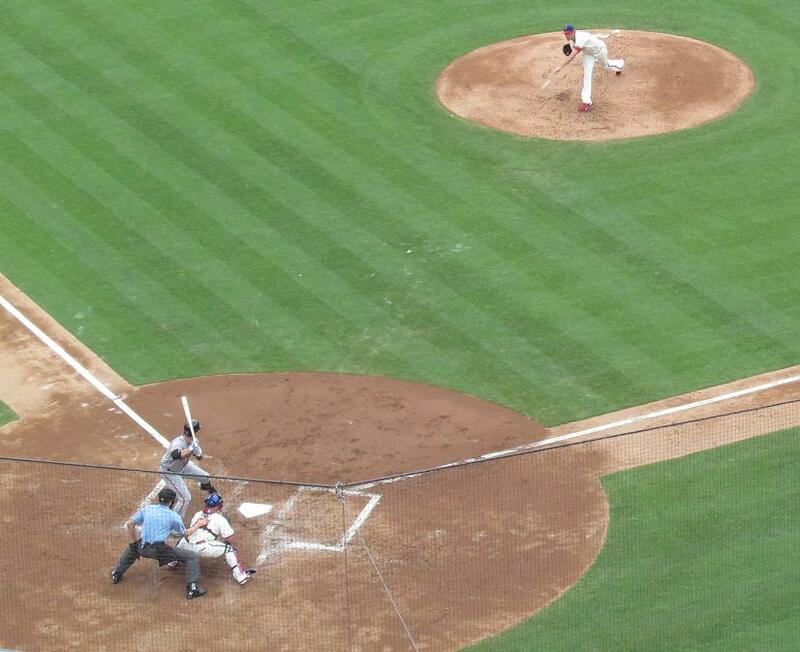 A Pitcher Hitting a Home Run - Bucket List it. It took 240+ games for me to finally see a Pitcher hit a dinger, after that it took 7 batters to see it happen again. Baseball is a strange game. 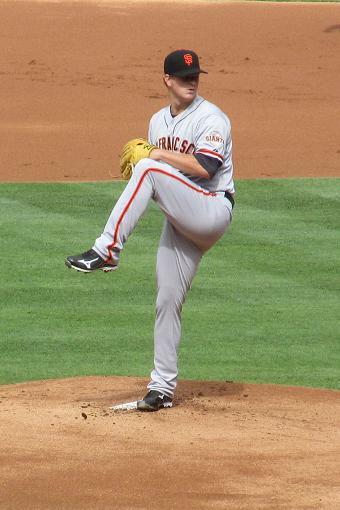 Lot of noteworthy things happened at the Giants Phils game on Saturday unfortunately the Phils took the loss 6-5. In addition to the Pitchers going deep All-Stars Buster Posey and Melkey Cabrera had Homers for the Giants. one-time All-Stars and recent DL returnees Chase Utley and Ryan Howard hit them for the good guys. Therefore the game had lots of star-power, but in the end it was won on a squeeze bunt by xxxxx who was only playing because Angel Pagan got ejected. I say it again strange game. This is the pitch that Posey hit out. Not very often I get a pitch where something big happens. typically in those situations I am a fan rather than a photographer. The ball is barely out of Hamels hand in this shot - maybe if you know something about pitching mechanics you can figure out what Hamels did wrong on this pitch. Another Pitcher Batter shot. 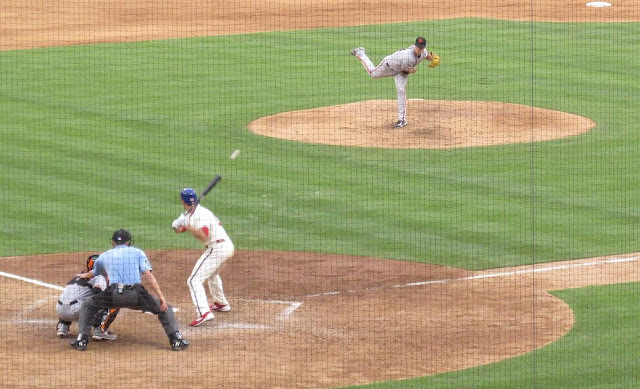 This is NOT Utley's Homer - this is an at bat in the 8th inning - Cain won this meeting with a strike out. The Phils took the loss in what otherwise was a fun game to see. As noted above the stars came out for this one and the day was beautiful. It was photo day so we got a chance to walk out on the field and see some of the Phillies players up close which was fun. During the Photo portion of the day Ryan Howard came out for pictures and graciously walked the entire field for fans. I am not sure if he should have been out there, maybe it is just the way the big man walks around but it appeared to me that he was limping a little bit. I have concerns that he will be able to finish the season. Which Ball Player Would You Base a Reality TV show On? I am not sure if this show will capture my attention - I am no TV snob - I watch a lot of trash TV - and oddball reality programs. I am rolling my eyes now, and can only see myself rolling my eyes when the program airs. If you could base a show on a retired player from your favorite team which player would it be? Labels: Pete Rose, Phillies, Reality TV. 1975 Topps Rocks at Rolling Stone! Author, Music Reporter, and Baseball Fan Dan Epstein is hosting an interesting feature on the Rolling Stone Magazine website revolving around Baseball's Great Questions. Each installment features a inquiry or subject for which several Pop/Rock musicians comment upon. The panel of musical artist varies a bit in age, peak era, and musical significance. but they do have some things in common they all appear to be good baseball fans and all are male. The column is called "High and Tight" for more background click here. Of interest to card collectors is that each panelist is also portrayed on a "card" inspired by the 1975 Topps design. On the heels of our visit with Night Owl Cards, I think it is very appropriate to have a post referencing 1975 Topps since NOC did such a great job chronicling the set. Faux 1975 Topps George Thorogood. I am not real familiar with about half of the musicians, but there were a few that were on my radar. None of the Musicians on the panel represent the Phillies. I am a bit miffed that Delawarean George Thorogood is a Mets fan. Here are some of the cards for musicians that I recognize to some degree. Some younger or hipper folks may know a few of the other artists. There are about a dozen contributors. Yorn covered a song for the Warren Zevon tribute album "Enjoy Every Sandwhich"
Wynn leads an outfit called The Baseball Project that has put together a couple of fun albums composed of nothing but baseball related songs. To check out the complete set of 75 Topps Rockers check out High and Tight. The Phillies are out on the West Coast which means today we are very fortunate to have Night Owl Cards in the house to discuss the LA Dodgers. Despite a tough weekend the Dodgers are surprisingly in the playoff mix as we begin the second half of 2012. 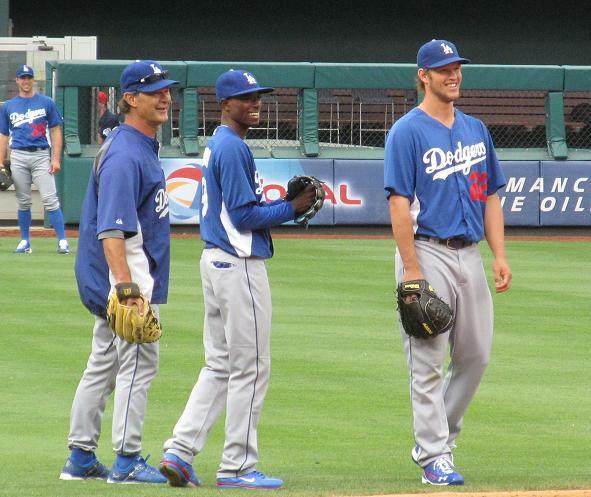 1) Who or What has been the Dodgers Biggest surprise this season? Wow. There are so many. Elian Herrerra actually producing for the Dodgers after 9 years in the minors. Chris Capuano being the starting staff's most consistent pitcher. The Dodgers getting rid of Frank McCourt so efficiently (it only took 2 billion!) But I think the biggest surprise is the most obvious one -- that the Dodgers still lead the NL West in mid-July despite anyone who is any good being on the DL. 1. 2009. One of the best ever. 2. 2011. I think I'll like it even more years from now. 3. 2010. I know a lot of people hate it. But I like colorful sets, and that one had color everywhere. 4. 2012. I still don't understand the design. It will always be The Tumor Set to me. 5. 2008. One of the worst ever. The photos were almost an after-thought. 3) Will the DH be used throughout MLB baseball in 2013? (*Gasp*) what have you heard? I hope not. How are we going to collect cards of pitcher's batting if they never get to bat? The wonderful moment of surprise seeing a pitcher hit a home run or a double will be gone forever. I think pitchers batting can be fun. They're both ex-Yankees, but for some reason I associate Torre more with the Yankees than Mattingly. I got the impression that Torre was with the Dodgers because it was as far away from the Yankees as he could get. Mattingly just seems like he wants a job and he wants to be good at it. So, I'll say Mattingly. 5) In which journey have you learned more baseball - 1971 or 1975 Topps. I'd say 1975, only because I'm only 70 cards into the 1971 blog. But it'll probably end up being '71 because there are so many players in that set that I never knew. It was five years before I started following baseball. Good work by NOC as always - Glad to see someone else out there that doesn't hate 2010 Topps. Looking forward to seeing more on the 1971 topps blog. This Saturday July 14th the Philadelphia Althletics Historical Society is hosting an autograph session with Bobby Shantz. 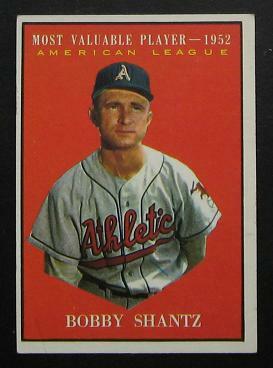 Bobby Shantz was the NL MVP in 1952. He also pitched in the World Series as a Member of the 1957 and 1960 Yankees. Shantz is a member of the Philadelphia Sports Hall of Fame and was profiled here last August. Recently a couple of really nice Bobby Shantz posting have gone up on card blogs including these. Bobby Shantz is scheduled to appear at the A's society from 11:00a till 12:30p on Saturday. For more information on signing click here. I am sure that it will be talked about more then it needs to be but Carlos Ruiz is scheduled to catch R A Dickey in tonights All-Star Ggame. Chooch is a professional and if he can handle the Phillies erratic relievers I think he can do a servicable job with RA Dickey's Knuckler. I love this card - These were inserts with 2008 Topps. This was a year before the 2009 Heritage set came out which homaged the 1960 Topps set. Just wanted to show the flip side of this card - in the 1960 set in the bottom left they list a bunch of season highlights. This is something I would like to see Topps bring back for the base set. I would not want to see it every year, but it really hasn't been done (other than in 09 heritage) since then. Allen & Ginter Blaster Break! FREE Tickets to the National!